A new film by Britain’s greatest living director. Yes please. An emotional bolt to the heart. Agyness Deyn’s performance is one for the ages. Agyness Deyn is the star of Terence Davies’ rhapsodic Sunset Song. 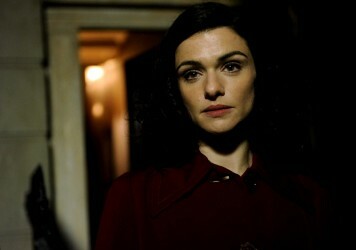 As Chris Guthrie, she inhabits the soul of this beleaguered waif. It’s a sensational performance: generous, tender and discreetly controlled. It’s due to her ethereal presence that we are plausibly transported back to the rolling farmlands of early 20th century Scotland. She is Lilian Gish in The Wind or Way Down East, her captivating innocence made to stand firm while under heavy fire. As she weeps, we weep with her. As it should be. The film sees her rebuffing the torments of daily life with nary a pout, while accepting good fortune with guarded cheer. Tears roll down her cheeks as a manifestation of her pain, her body lacking the resolve to hold them back. It’s understandable considering all she goes through – lightly numbed to adversity and contentment both. Perhaps we could see her as a more melancholic and dainty version of Scarlett O’Hara – both characters cherish the land as a preserver of personal history. For them, a house is more than an ascetic domicile, it’s a specimen jar filled with remembrances. For Chris, the landscape is an extension of her very being, a tangible memory bank which remains steadfast as family and friends are brought into the world and made to exit from it. The way in which Deyn intones her narration is in itself a marvel of emotive enunciation. She speaks not as if addressing a figurative audience, but as if she is reciting poetry in private. This acknowledgement of the story’s literary roots is suggestive of a conceit that’s close to director Terence Davies’ heart – that art and life are not merely inextricable from one another, but are the same thing. The subtlety with which this stylistic gradation is executed exemplifies how deeply Davies understands the medium. His process of adaptation isn’t merely a case of pruning back a source to fit the screen, but ingesting it whole and producing a work that could only exist as a film. Deyn, it appears, is wholly simpatico with this artisan process. Davies’ masterful Sunset Song offers a panoramic survey of an era as directly experienced by a single person. Chris’ abusive father (Peter Mullan) dominates the film’s opening chapter, a quick-tempered man’s man who is so consumed by self-loathing that he drives away those close to him. His wrath is later displaced by the onset of World War One. The brutalising effects of the conflict on her affectionate beau, Ewan Tavendale (Kevin Guthrie), are bracingly felt through her restricted perspective. Each scene segues into the next with a vaporous cross-dissolve as time is seen to build and destroy, softly, and without discrimination. Chris loses her family, acquires a new one and then loses that as well. A sexual awakening brings possibility and danger. The comfort of family life brings more loved ones to be placed on the chopping block. 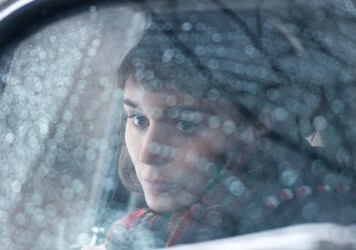 Yet the film is never morose, and she willingly adapts to the constant changes of situation. She’s an optimist, though not to the point where she’s able to brush off tragedy and move on – she takes on knowledge with each new setback, allowing it to make her stronger. 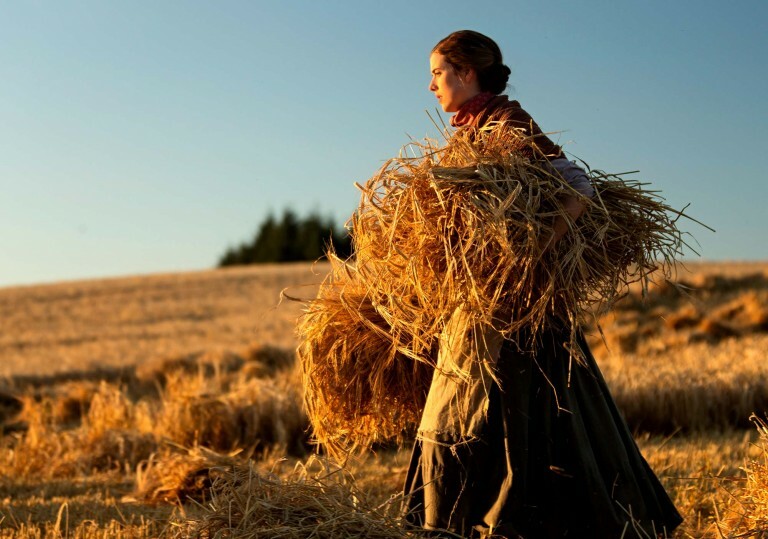 Trite though it may sound, the immense power of Sunset Song derives from the insistence – via Davies and author Lewis Grassic Gibbon, upon whose sublime Scottish pastoral the film is based – that we must learn from the past without dwelling upon it. The plush splendour of the landscape is a tonic for Chris’ woes. It’s her one constant. Davies films exteriors in 65mm and captures the idyllic rapture of gently shimmering wheat fields but avoids undue romanticisation. When Chris is indoors, the divine exterior light streams through the window and onto her face. Kinraddie is a utopia worth defending, which becomes the source of Chris’ most immense bout of suffering when Ewan is called up to fight. 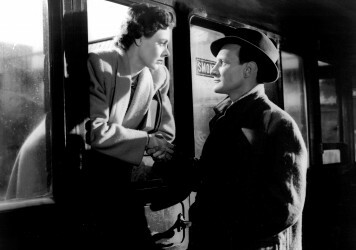 And just as Davies opened out the closed romantic love-triangle in his previous film, The Deep Blue Sea, with a single tracking shot down a crowded Underground platform, he transforms Sunset Song into a universal tale with a single overhead shot depicting the muddy detritus of the battle field. The film’s most beautiful moment, however, serves to epitomise a perfect marriage between Davies’ nakedly heartfelt sensibility and Deyn’s meticulously worldly depiction of Chris. An extended wedding sequence harks back to the living tableaux of films like Distant Voices, Still Lives and The Long Day Closes, and it climaxes with Chris singing a song, a capella, to the tipsy revellers. It’s utterly transfixing, because of Chris’ bravery, and the rugged melodiousness of her voice, but also the fact that this moment of ecstasy is tinged with a palpable sadness. She loves Ewan, but understands that this state of bliss is transitory. Ahead Sunset Song’s release, Adam Cook revisits a scene from the director’s sublime wartime drama.